There is much to look forward to in a quiet town such as Nieuwoudtville when a network of SKEP partners come together and implement a full week summer school programme with the purpose of raising awareness about biodiversity and informing the youth about environment-related activities. This is precisely what took place during December 2017 when the annual summer school was held in Nieuwoudtville. Themed ‘Biodiversity and Water’, the Custodians of Rare and Endangered Wildflowers (CREW) invited local partners from the South African National Biodiversity Institute (SANBI), the Environmental Monitoring Group (EMG), Conservation South Africa (CSA), Stellenbosch University and Indigo development and change. 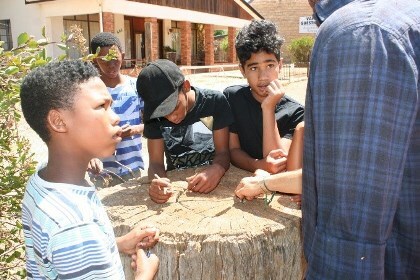 The aims of this summer school were to introduce biomimicry through practical activities, to explore ideas for ‘green’ business opportunities, to teach learners about the importance of biodiversity and nature conservation, to learn and share knowledge and have fun through educational activities, to create a safe space for learning, and to improve self-awareness of entrepreneurship in a green community. The programme was set in motion with a lesson on biomimicry and practical activities. Stephano Beukes, a student from Stellenbosch University facilitated the session. He introduced this topic and gave some background information about the meaning of biomimicry. He also showed the learners a movie to give them a better perspective about this topic. After the movie he took the learners for a short walk in town where he explained some practical theory around biomimicry. At the Hantam National Botanical Garden, learners were invited to have some relaxed fun, which involved games, creative painting and drawing, and creating their own Christmas trees. Rochette Daniels and Annmarie Bonn from CSA were involved in the programme as observers and facilitators. Daniels and Bonn introduced the learners to ‘entrepreneurship in a green community’. Daniels presented to the learners the aspects of environmental principles as described by the Business Environmental Performance Initiative (BEPI). The aim of this presentation was for the learners to understand the performance areas that can be looked at for a business to be labelled as a green business. They should be able to make the link between business and the environment, see how business can enhance and improve the environment, and identify the challenges involved. In the afternoon Danzel Januarie from Indigo Development and Change facilitated an interactive session on ecosystems with a practical activity. Learners created ‘bottle eco-systems’ wherein they planted a variety of seeds which they hope to see grow in the new year. The Kirstenbosch CREW team facilitated activities which involved walks in the field where learners had to measure their own plots, observe and find specific plant, animal and insect species for data capturing purposes. An information and active listening activity was facilitated by Siyabonga Myeza from the Environmental Monitoring Group (EMG) at Avontuur, a conservation farm which lies about 15 km from Nieuwoudtville. Brief introductions about the farm and the project activities EMG is involved in were shared. The last day of the summer school week focused on remembering the late Kariena Voster. Voster was one of the first nurses in the local community clinic. Some people also refer to her as Nieuwoudtville’s own Florence Nightingale. Kariena was involved in the lives of almost each and every child from Nieuwoudtville since birth, and one of her wishes before she passed on was to give an opportunity to children from this town to go to Strandfontein beach. The aim of this day was also to remember Voster for the person that she was. The Nieuwoudtville summer school is a vibrant example of SKEP institutional partners in action, involvement of the youth engaged in site-based activities with practical demonstrations. These learners are being capacitated and groomed to be the custodians of current and future generations for biodiversity conservation efforts in the Succulent Karoo.